San Francisco Hop On Hop Off Tour - Official© bus tour. This HopOn HopOff tour package includes all the major sights of San Francisco with unlimited HopOn HopOff access on the Downtown Tour and the Original City Tour. Hop On Hop Off at any of the stops along the route for convenience. Tour is provided on a first come first serve basis. Kids love the open top buses. Have a group of 10 or more? Work with one of our group specialists to make sure you get the best price and service! This Official City Tour is a 2 hour Hop On Hop Off tour with the best views of San Francisco's neighborhoods and attractions. Hop On and Hop Off as many times as you like at any of the 40+ stops at major San Francisco landmarks. Tour stops include Union Square, Golden Gate Bridge, Chinatown, North Beach, Fisherman's Wharf, Golden Gate Park, Haight-Ashbury, City Hall, and much more. 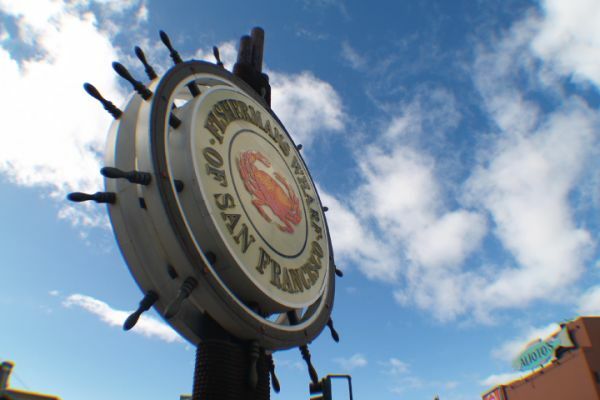 The Official City Tour begins at Fisherman’s Wharf taking you towards Ghirardelli Square. See the majestic Golden Gate Bridge off in the distance as you pass through the Cow Hollow and Marina Districts towards the Palace of Fine Arts. Venturing further on to the Golden Gate Bridge where you have a chance to Hop Off and walk the 1.7 mile span of this famous suspension bridge or take a stroll through the historic military base and visit Fort Point or Crissy Fields. We continue through the San Francisco Presidio where you will see more of the historic military homes as well as the exclusive Presidio Cemetery. 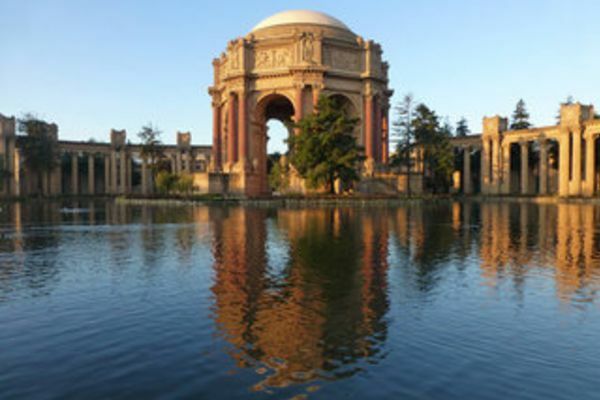 Next stop is the Golden Gate Park, home to many museums and attractions including the Conservatory of Flowers, deYoung Museum, California Academy of Sciences, and the Japanese Tea Gardens, as well as miles of hiking trails, bike paths, lakes, waterfalls, windmills and much more. Our main stop here is outside the California academy of Sciences. From here we will take you back in time to the Haight District and the "Summer of Love". Visit the well preserved 1960's theme with a new age touch at Haight and Ashbury. View the murals and art dedicated tothe San Francisco hippie culture and the beginning of psychedelic rock music from such artists as The Grateful Dead, Janis Joplin, Jimmy Hendrix, and Jefferson Airplane to name a few. 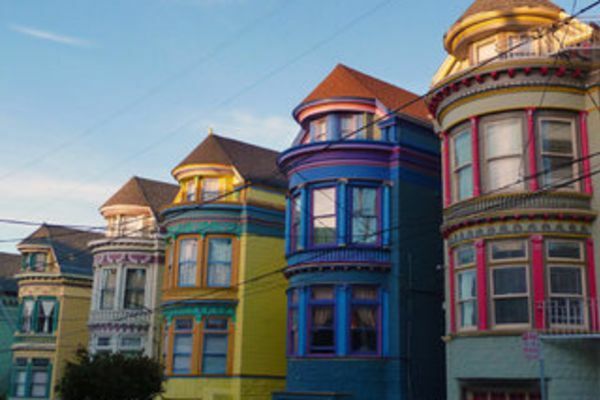 You will then see you by some of the Painted Ladies Victorian homes and head nearby the famous "Postcard Row", with a row of homes features on postcards nonetheless as well as Movies and television shows suchas "Full House" and "Mrs. Doubtfire". Your tour will continue towards the downtown area of San Francisco where you will get great views of San Francisco's City Hall and a chance for some retail therapy at Union Square. Here you can also Hop Off and enjoy our Official Chinatown Walking Tour. Hop back on to continue to the Chinatown Gates before heading through Chinatown with photo opportunities of Portsmouth Square, known as the "Heart of Chinatown" but made famous by the raising of the American flag by Captain Montgomery of the USS Portsmouth. From here you will make your way towards the bay and to Fisherman's Wharf. Pier39 is one of the top visited locations in San Francisco next to the Golden Gate Bridge. Once you arrive, you certainly will not wonder why. Pier39 is chock full of shopping, attractions, entertainment, people and food! Some great attractions to check out include The Aquarium of the Bay, the 7D Experience, Rocket Boat and the San Francisco Bay Cruise. And don't forget to check out the famous Sea Lions located towards the back of Pier39. Spend the remainder of your day here or continue with us through Fisherman’s' Wharf. Your tour ends here at Fisherman's Wharf, also your starting location. Fisherman's Wharf also brings a lot to the table for excitement and entertainment as well as leisure and dining. Check out the thrill of The San Francisco Dungeon and Ripley's Believe it or Not! or visit the Madame Tussaud Wax Attraction before a nice fresh seafood lunch or dinner at one of the many restaurants along Fisherman's row. Other places of interest here are the Del Monte Cannery Building, Hyde Street Pier where you can visit Historic Vessels such as the Balclutha, Alma, Hercules and more. Ask your guide about taking a Segway tour down through the Aquatic Park for more great views and information about Fisherman’s Wharf. The San Francisco Downtown Hop On Hop Off Bus Tour shows you some of the best sights of central part of San Francisco. Enjoy an entirely live narrated 75 minute tour of San Francisco's most famous sites, with our professional and entertaining tour guides. The Downtown Tour includes unlimited use for 24 hours so you can Hop On Hop Off the bus at any of the 14 designated stops during the tour to browse, shop, & take pictures. Explore the highlights of San Francisco on your own schedule and simply hop on the next bus when you are ready to go to the next location. Downtown tour highlights include; Fisherman’s Wharf, Barbary Coast, Financial District, Ferry Building, South of Market, City Hall, Union Square, Chinatown, North Beach, Lombard Street and Pier 39.